The first think I noted was that the design of the extruder means that I have should have fitted it to the carriage before final assembly. 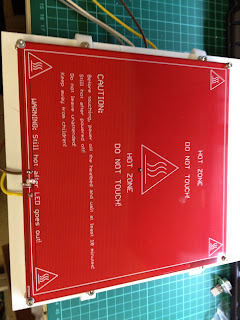 I also think I need to figure out the hot end wiring at the same time, else I'll be tearing it down again. I started with the bed. I had bought a load of DiBond FR as it is meant to be fire resistant, so should handle the heat better. 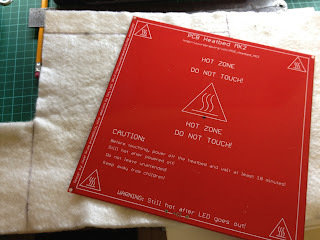 While reading up on how to fit the PCB heated bed, it also became apparent that the purging notch is no longer needed for the bed. Great, that means my DiBond can be used without cutting, although it does make it larger than the PCB/heated area. To make up for the 8mm height loss fibreglass matting, I am going to trim down the printed springs I have (well actually, I'm slipping them over the side of the DiBond, see the pictures). I've read they break anyway and people have moved on to using real springs. 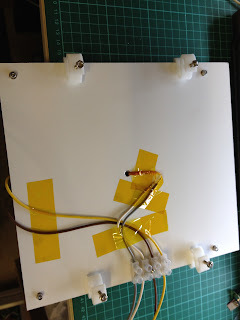 Heck, come to think of it, if I mount the PCB on floating bolts then the fibreglass matting will provide some spring anyway (but I'm not taking that risk right now). In order to use the centre hole for the thermistor, I drilled a corresponding hole in the bed plate and cut a hole in the fibreglass matting. The PCB board and thermistor is now wired up and the bed mounted as per the pictures below. 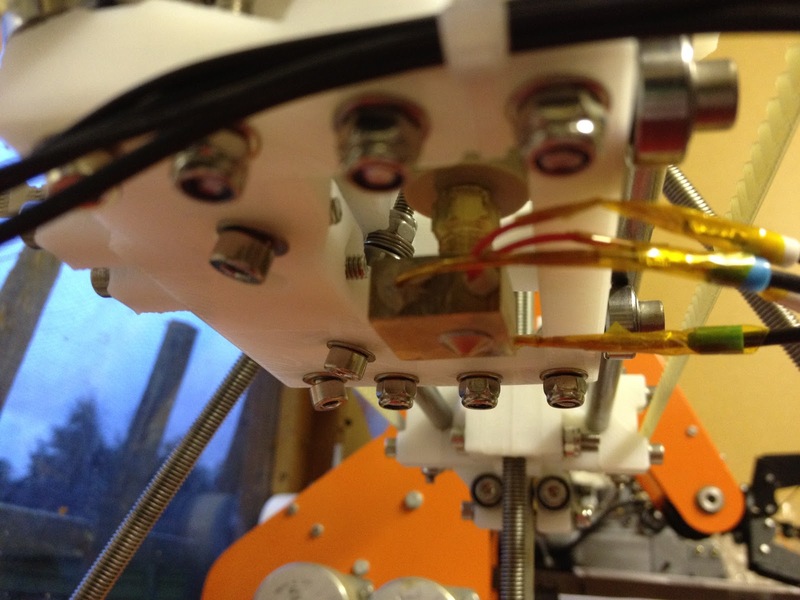 Next up, mounting the ParCan MK2 Hot End. As I mentioned above, I had to strip down the extruder to mount it to the X-carriage, but that went quickly as I knew what I was doing. I cut a small notch to clear one of the long bolts, that being easier than cutting the bolt. 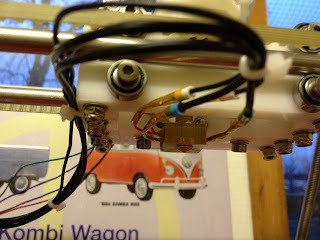 I then reassembled the whole lot and started on wiring the hot end. It went really easily thanks to ParCan supplying some bootlace ferrules with his kit, so that the wires are simply crimped. 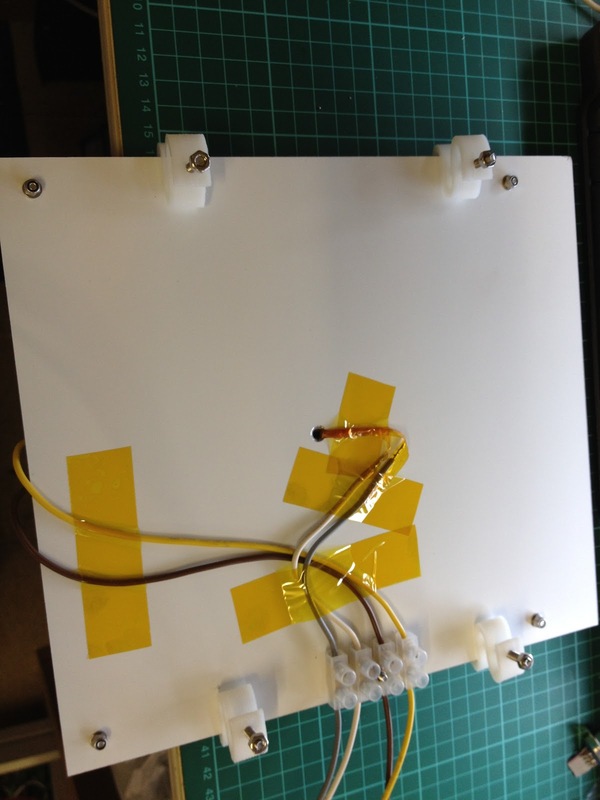 I then insulated them with some Kapton tape. I did however note that this hot end is very close to the x-carriage. Looking at the later Prusa Mendel carriages with the LM8UU bearings, they are MUCH slimmer which would result in the hot end being further from the plastic. I expect to get some heat damage on the carriage, so this might have to be the first area to change. Pictures below!! The next job will be to locate a suitable piece of glass for the bed. I know a lot of people are using normal glass, but I prefer going with the safer option (as many others are) of using heat resistant glass. Glass place mats or pot stands should work, so I'll be keeping an eye out for something suitable. If anyone out there knows where I can get a 20cm x 20cm glass pot stand, please let me know. 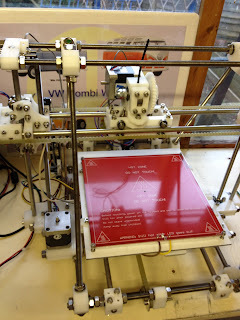 However, in the interim, I am sure I'll be trying out the heating and starting to calibrate the machine.